Only a month or two ago we were happy to release The Smoking Mirror, by David Bowles, in part because it was the first of our imprint’s line of young teen/middle grade novels. Lo and behold! 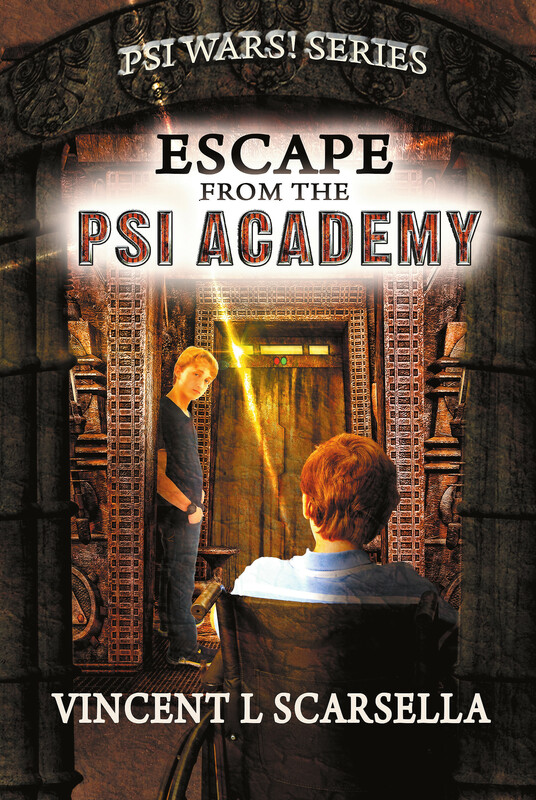 we now have a second, Escape From The Psi Academy, Book 1 of the Psi Wars! series, by Vincent L. Scarsella. “We have particular love of stories for this age group,” IFWG Managing Director, Gerry Huntman, stated, “because adventure is unadulterated, uncomplicated, and escapism is the goal.” We are sure that middle grade readers, as well as young adults and adults, will enjoy the first of this exciting series. IFWG is also impressed with Elizabeth Lang’s cover artwork and design, which captures the novel perfectly. From the first day of his arrival at school in a wheelchair two weeks into the semester, Henry Greenberg suspects that Sebastian Drake has special powers that foils the cruel antics of the 9th grade bully, Frankie Nytz. Henry soon befriends Sebastian and is thrilled when they are both selected to attend the Psi Academy, a special school in an underground base set up by the military to enhance the psychic powers of young teens for possible use in a war against evil psi warriors for world control. While at the Psi Academy, Sebastian and Henry and their fellow 28 cadets are taught by its eccentric faculty how to develop their diverse innate psychic powers such as mind reading, tele-influencing, bending objects, walking through walls, remote viewing, fortune telling, conjuring wraiths, and even summoning the dead. These powers are also enhanced during the playing of competitive video games known as ‘Mind Games’. But several weeks into the grueling curriculum, Sebastian and Henry suspect that the Psi Academy may be hiding a deep, dark secret and that the good guys running it may not be good after all and the bad guys not bad. Escape From The Psi Academy is currently available in trade paperback format via this page, and will soon be available through all good online retailers, including Amazon (now). The ebook version will be released very soon. This entry was posted in News, Title and tagged escape from the psi academy, middlegrade, new release, psi wars!, vincent scarsella by Gerry Huntman. Bookmark the permalink.